YAMAGATA - An All Nippon Airways Co. pilot and crew members were being investigated by accident inspectors Sunday, a day after their flight from Tokyo overran the runway at Shonai Airport in northern Japan. While no one was injured among the 161 passengers and six crew members, and the plane from Tokyo’s Haneda airport was not damaged after the overrun around 10:30 p.m. Saturday, the transport ministry said it should be designated as a serious incident that could have caused a disaster. Three inspectors, who were sent to the scene from the Japan Transport Safety Board, will begin comprehensive investigations from Monday. Despite the pilot’s application of the brakes on landing at Shonai Airport in Yamagata Prefecture, the plane overran the runway for about 80 meters and came to a stop in a grassy area, according to ANA. It was snowing at the time of the incident. 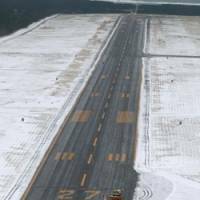 The plane was in a holding pattern over the airport for more than an hour before the removal of snow on the runway was completed. ANA apologized for “causing trouble to our passengers” and said it will “fully cooperate” with the safety board’s investigations. The 35-year-old pilot, who has flight records of 4,494 hours and 40 minutes, had not caused any accident until the incident, according to the airline. 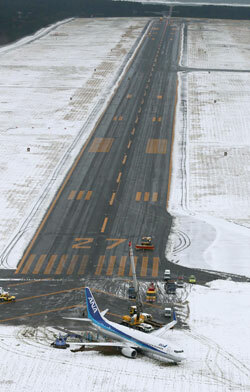 A total of five flights between Haneda and Shonai airports were cancelled Sunday. Flights at the airport resumed in the evening after the plane was moved to the tarmac.